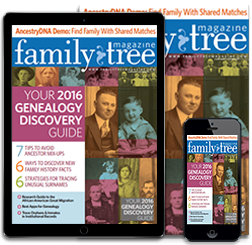 Subscribe to Family Tree Magazine Now and Save 62%! 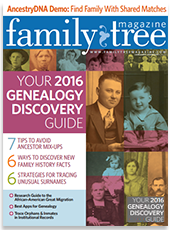 Subscribe now and get a FREE instant gift – 92 Hot Search Tips for Genealogy Websites. 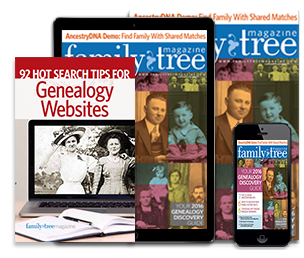 We've gathered Family Tree Magazine's best online genealogy tips into this guide to help you discover your family's unique history on the internet. 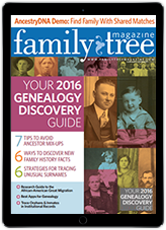 Canada and Foreign All-Access and Print Only subscription: Canada add $8.00. Foreign add $10.00. SUBSCRIBERS' AUTOMATIC RENEWAL FEATURE: I understand that I will receive uninterrupted service and delivery of my magazine and that my subscription will be automatically renewed each year at the rate then in effect. I won't be bothered with any renewal notices in the mail; instead, I will receive a clearly marked annual reminder 6 weeks before my credit card is charged. I may cancel at any time during my subscription and receive a refund on any unmailed issues by calling 1-888-403-9002 (U.S.), 1-386-246-3364 (Int'l).